Before we begin, I’d like to give a shoutout to both ESPN’s Home Run Tracker and, of course, BaseballSavant, for making this glorious research possible. Excellent, it took us almost no time at all to get to a Mike Trout thing. You guys love Mike Trout things. We all love Mike Trout things. This year, Trout’s average home run went for 413 feet, the fourth-highest mark in the MLB. Last year, Trout’s average home run went for 420 feet, the very highest mark in the MLB. This homer here went for 489 feet, which is the farthest of Trout’s career by nearly 30 feet. The first half mark to beat here was 484, by Giancarlo Stanton. The location of this homer shouldn’t be too surprising. Right field in Boston is just 302 feet – the shortest outfield distance to either side in the MLB. This one was measured at 318 feet, beating Chris Davis‘ first half number by one foot. But the best part of this gif isn’t the home run, per se. It’s that little box in the lower right-hand corner of your screen before David Ortiz goes deep. This was the eighth pitch of the at-bat. Brad Peacock had a plan of attack: Pitch David Ortiz outside. Presumably, to keep him from doing something exactly like he ended up doing. Ortiz had fouled off four consecutive pitches on the outer half of the plate, waiting for Peacock to Peacock and serve up the exact pitch that he did. After executing his strategy flawlessly for seven consecutive pitches, Peacock left one over the middle and Ortiz hit the shortest home run of the 2014 season. So, I almost wrote this post on Saturday evening, figuring the data sets were as good as complete, and that nobody would hit one of the most extreme home runs of the entire season in the last game. I ended up not writing this post on Saturday night because I had to wake up early on Sunday morning to cover the Indians game. And it’s a good thing I waited, because at that Indians game, Zach Walters hit the hardest-hit dinger of the year. Walters is such an interesting case because, physically, he looks nothing like the player he is. He’s a wiry, 6-foot-1 utility player who had a higher isolated slugging percentage than Nelson Cruz and Jose Bautista, with a higher strikeout rate than any qualified batter in baseball. In the offseason, Walters plays softball with Jose Canseco in Las Vegas. If he can hit baseballs with this kind of speed, I can only imagine what playing softball against him is like. Probably terrifying. The ball left Walters’ bat at 122mph. The previous highs were by Giancarlo Stanton and Ortiz, at 119.9mph. Walters didn’t just hit the hardest homer of the season, he cleared Giancarlo Stanton and David Ortiz by two miles per hour. This pitch was thrown at 92mph and had a recorded exit speed of 90.8mph. That day in Detroit, there were wind gusts of 37mph, which is evidenced by right fielder Dayan Viciedo’s confusion in right field, and the fact that a ball which left the bat slower than it was pitched went for a home run. The previous low of the year was by Trout at 91.8. If Corey Dickerson’s homer here didn’t clear the next-highest one by 11 feet, I may have been inclined to give it an asterisk. This was hit, of course, in Coors Field, where the air is thin and balls travel far. Home Run Tracker estimates Coors being the only ballpark in which this ball would have resulted in a home run. The apex of this homer was 171 feet, knocking off Jose Abreu and his 160-foot high homer from the first half. That is a crazy home run. That is a crazy home run off Felix Hernandez! I love the juxtaposition of this homer and the one above it, because this one can happen nearly two times before Dickerson’s lands. Anyway, I don’t need to talk too much about this particular dinger, because Jeff Sullivan already did so here. Information relevant to the purposes of this post: Its apex was just 41 feet, the previous low of the season was Josh Donaldson, at 43 feet. You thought this was going to be Mike Trout again, didn’t you? We all know about Mike Trout and the low pitch, but we also know about Pablo Sandoval and the “any kind of pitch.” Sandoval swings at everything, so you’re going to see some dingers like this. 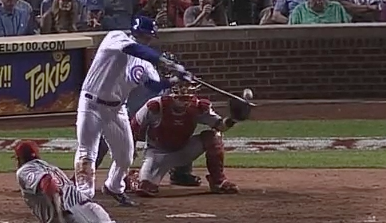 This pitch was just a little more than a foot off the ground, and he sent it over a wall 383 feet away. Apparently, Giants batters can hit anything. Look at that, another one of the season’s most extreme homers in Coors Field! (It’s not the last one.) This pitch was over a foot and a half inside from the heart of the plate, but Nolan Arenado opened his hips and turned on it. This was the eighth start Martin Perez made, and it was the first homer allowed. So, here’s a similar scene. It might not look like it, because I had to use different broadcasts to capture these gifs, but this is the same game as the Arenado homer, just three innings later. Martin Perez made eight starts to begin the season and didn’t allow a home run. He went to Coors Field and gave up two of the most extreme home runs in baseball. This pitch was 1.2 feet outside from the center of the plate to Troy Tulowitzki, who is good. The Rockies have taken over the post! The Rockies have taken over the post! Only one of the 14 homers in the first half incarnation of this post came at Coors Field. By the end of the season, that was upped to four. Corey Dickerson turns on this pitch 1.4 feet inside from the center of the plate to make his second appearance on this list. Also, both of those homers were off Dan Haren. Allowing 1.31 home runs per nine innings will do that to ya, I guess. Like last time, I’m gonna end this with a zany inside-the-parker, because who doesn’t love zany inside-the-parkers? Lorenzo Cain is already super fast, so he doesn’t need too much help, but Don Kelly gives it to him anyway by picking up Torii Hunters glove instead of the baseball. You can record an out by throwing a baseball to another player under the right circumstances. You cannot do so with Torii Hunter’s empty glove. We hoped you liked reading The Most Extreme Home Runs of 2014 by August Fagerstrom! This one line drive out that Walters hit into against Detroit still sticks in my mind. No idea what its actual speed off the bat was, but it LOOKED like one of the hardest-hit infield outs I’d ever seen. Crushed a line drive right into Victor Martinez’ glove.